It may be used stand-alone as a full strength Matcha brew, or mixed in drinks, blender beverages and in culinary recipes with a smooth, balanced, delicately sweet flavor and pleasant green aftertaste. Ideal for daily consumption, this very high quality Matcha blend features a smooth, balanced and delicately sweet flavor and pleasant green aftertaste. It may be used stand-alone as a full strength Matcha brew, or it may be used in mixed drinks, blender beverages and in culinary recipes. When used as an ingredient, the matcha flavor will be more subtle than the superfood grade. 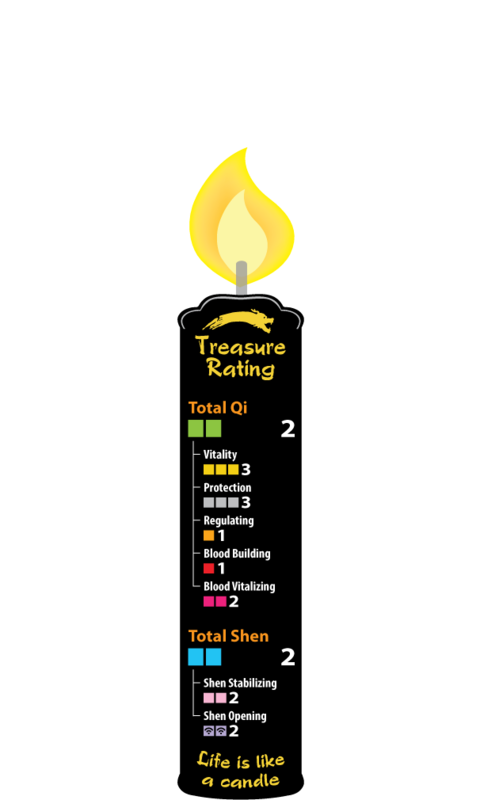 It is a great Shen tonic and antioxidant. 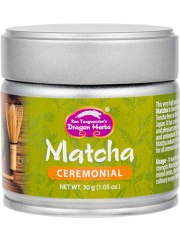 Our certified organic Ceremonial Matcha meets USDA-NOP, EU, and Japan Organic standards. Our supplier is the first company in the Matcha industry to obtain and receive organic certifications for all international markets: USDA, QAI, OMIC, and JAS certify all organic products for the North America, European, and Japanese markets respectively. Our Matcha is certified Kosher, Halal, Gluten-Free and Non-GMO. Steep 1 teaspoon in 8 ounces of high quality near-boiling water for 3-5 minutes and enjoy several cups a day. Matcha Green Tea, a treasured drink of Japanese culture and Zen Buddhists since the 12th century, has a thousand year history of production. Japanese nobility and, more famously, Zen masters and monks have traditionally consumed Matcha Tea to aid in meditation and contemplation. By simultaneously supporting relaxation and alertness, Zen meditators reach higher states of consciousness. Matcha is a finely-ground green tea powder of the whole tea leaf rather than the extracted liquid of the leaf. It is one of the richest of all teas in valuable nutrients, providing the whole tea leaf benefits of antioxidants, amino acids, vitamins, minerals, co-factors and fiber. Part of the cultivation “trick” that makes Matcha so great lies in the way it is cultivated. Grown in the sun like most plants, the last month before harvesting it is covered and grown in deep shade to enhance the development of chlorophyll and the consequent production of the unique tea amino acid L-theanine, which promotes clarity of thought, relaxation and a Zen state of mind when consumed by a human. The procedure also increases Matcha’s antioxidant level per gram — an extremely high 15 times that of wild blueberries. Matcha is indeed very good for one’s overall health. It is a world class Shen tonic and antioxidant. 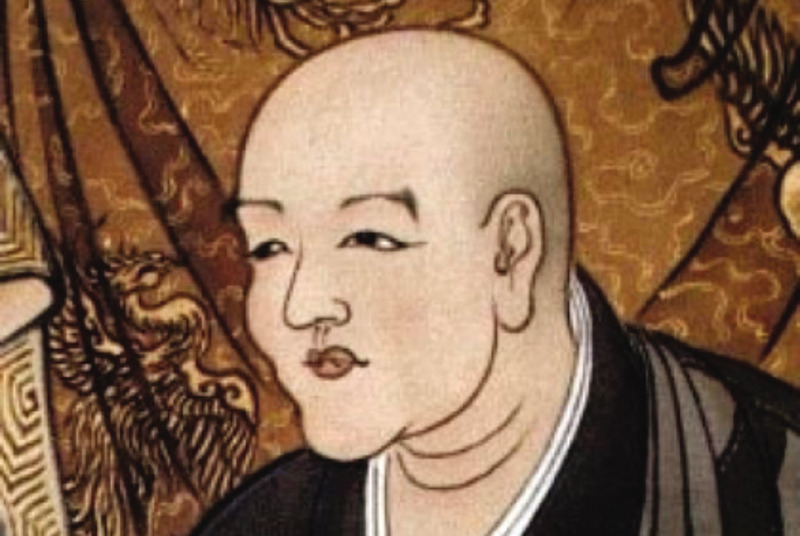 At the end of the 12th century, trending Chinese methods of preparing powdered tea were brought to Japan by the great Zen master Eisai Dogen in the form of crushed tiny pieces or rough powder boiled in water. Soon, making tea from the powder of tea leaves and whipping with hot water in a bowl became the trademark Japanese Zen Buddhist style of tea preparation. Tea drinking itself became central to Zen practice. Experimenting with ways to maximize the therapeutic and spiritual benefits of the tea, the monks learned that by cultivating the ‘Sencha’ Green Tea plant under shade conditions before harvest they got a superior tea. ‘Sencha’ has evolved over time into the carefully cultivated shade-grown tea plant ‘Tencha,’ the special tea leaves that are the basis of Matcha. The ability to finely grind tea into true powder form was introduced during the 14th century through the use of stone mills, at which time the tea began to be whisked as it is today. And thus Matcha was born. 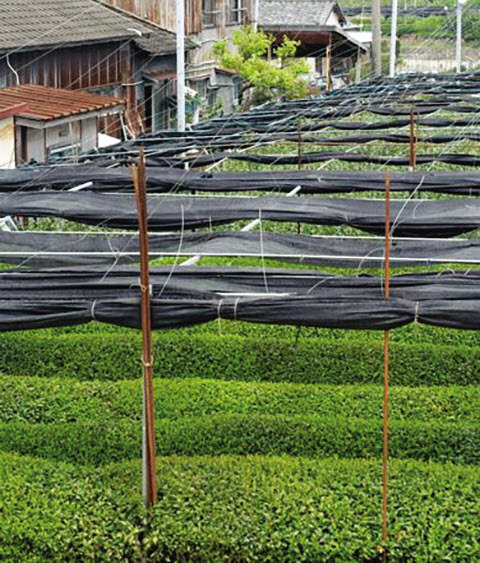 Tencha Green Tea requires very specific conditions to grow perfectly. All of Dragon Herbs Matcha is grown in the gentle mountainous Nishio region of Japan, at or above 2,000 feet elevation, famous for its very specific conditions for perfect tea cultivation since the thirteenth century. The cold temperature naturally keeps bugs away, so pesticides are not required. Groomed tea gardens cover the softly undulating hills. Fresh pristine river water, fertile soil, stable climate, misty mountain air and remoteness from urban development make this an optimal Di Tao location for the production of Tencha green tea leaves. Hundreds of farms in Nishio produce Tencha, but only a handful grows the smooth, sweet, high L-theanine premium Tencha leaves used to make the ceremonial and superfood grades offered by Dragon Herbs. 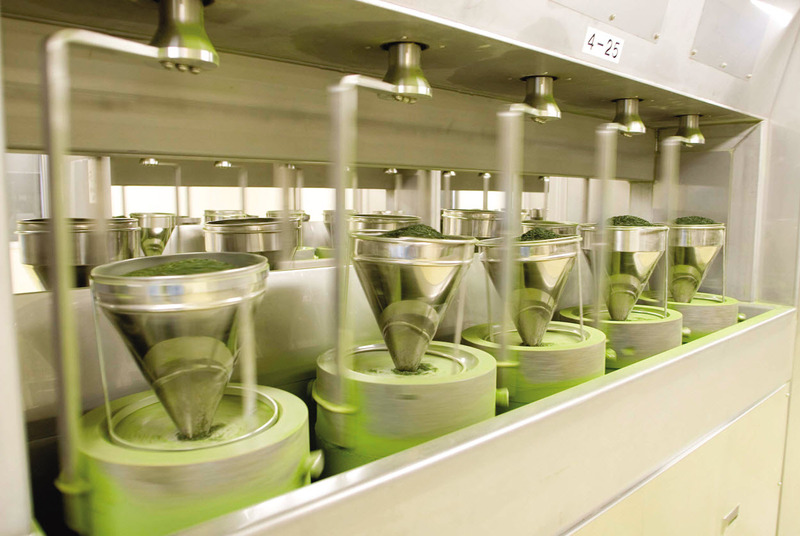 Our purveyor has been a leader in Japanese Matcha production since 1888, maintaining centuries-old techniques in modern production facilities. They are renowned for 130 years of consistent superior quality. Our supplier is the first company in the Matcha industry to obtain and receive organic certifications for all international markets. This Matcha is certified Kosher, Halal, Gluten-Free and Non-GMO. Tea leaves that later become Matcha are shaded for one month before cultivation, effectively blocking 90% of the sunlight, causing the over-production of chlorophyll, resulting in its bright green color and preserving its delicate amino acids, especially L-theanine, one of the most remarkable nutraceutical compounds in all of herbalism. The fresh green tea leaves are plucked by hand in early May, after which they are immediately steamed and dried into a ‘rough tea.’ The leaves are refined by removing the stems, veins and unwanted particles, leaving only the purest flesh of the leaves, which is now called ‘Tencha.’ The Tencha is then ground into a powder in stone grinders. Continuing a 120 year tradition, in-house skilled artisans maintain granite stone grinders that protect the color, flavor and nutritional components of Matcha. Each stone mill grinds only 30-40g of Matcha per hour. 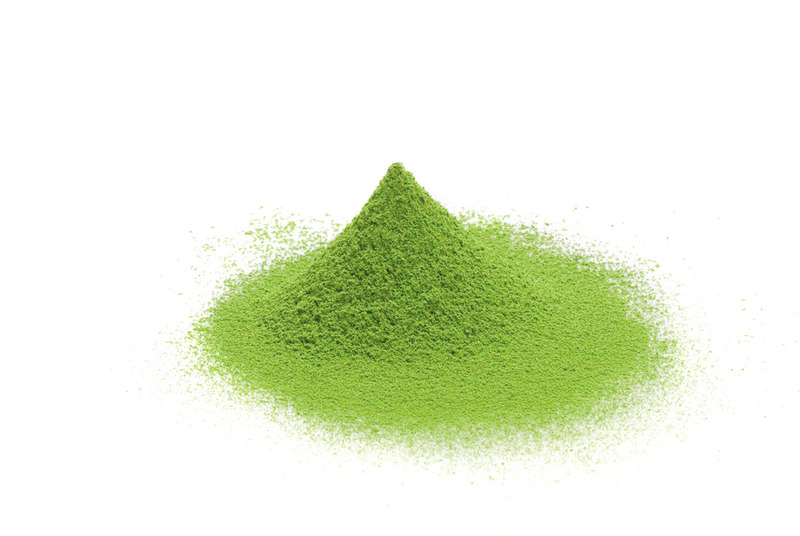 Matcha is produced by blending several varieties of Tencha to maximize the quality of each blend. Prior to grinding, each tea is evaluated according to taste, aroma and color. Quality Matcha flavor is smooth and sweet — from the L-theanine amino acids in the tea — with a slight astringency. Superfood quality Matcha has a stronger tea taste and is more pungent, which works very well in mixed teas, blender drinks and food preparation. The color of higher quality Matcha is a bright jade green and its feel is very fine (5-10 microns; finer than baby powder) and feels as smooth as eye shadow. 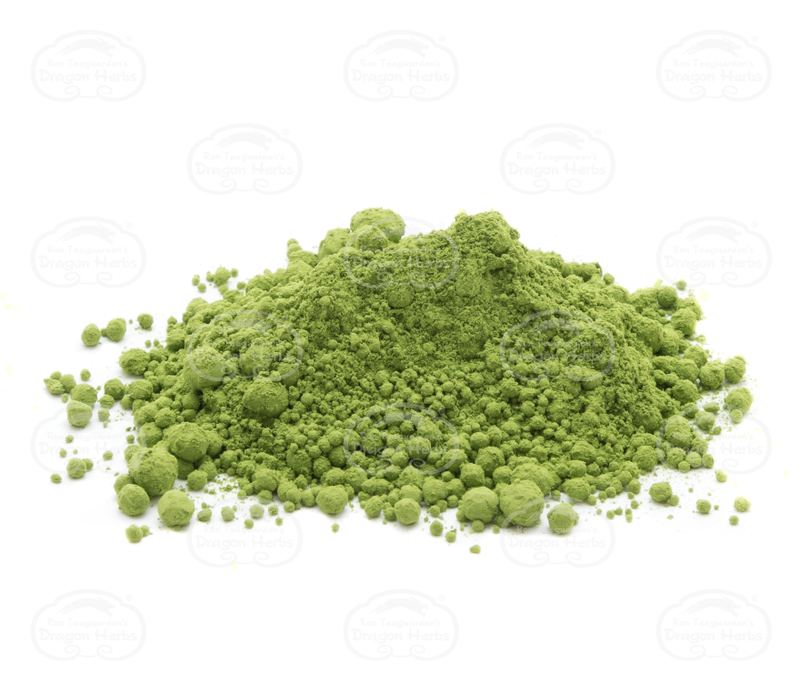 Lower grades of Matcha will have slightly larger particle sizes, with a slightly coarser feel — though still very fine. Our Matcha supplier also leads an ecological restoration project throughout southeastern Asia to bolster Mangrove and Mahogany tree populations. Mangrove trees, as coastal growing trees, uniquely occupy both land and sea and provide soil stability and homes for fish and other species in their roots. Not all of the tea grown by any grower can reach the grade required to be called “Ceremonial Matcha,” or “Superfood Matcha.” Nevertheless, our supplier buys the entire crop from each of the Matcha growers so that the farmers can be assured a fair profit and sustainability. This program is over 100 years old.